Banana Wonder: Vegan Apple Mahlepi Spelt Coffee Cake: Milopita? 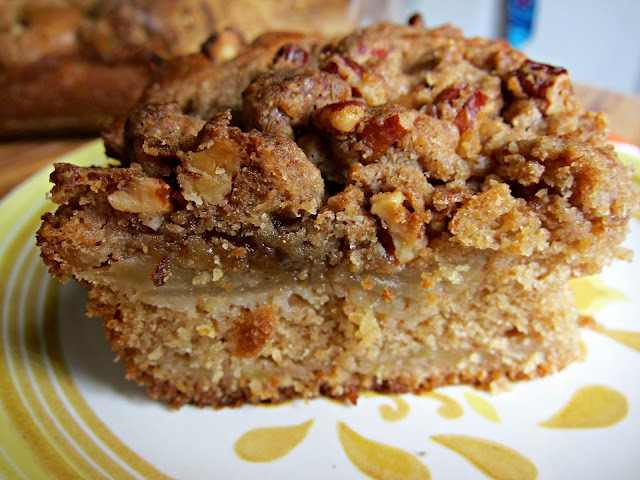 Vegan Apple Mahlepi Spelt Coffee Cake: Milopita? I've been vegan baking like crazy these past two week and it all started with this apple coffee cake, which I must say, is one of the best coffee cakes I've ever tasted. The recipe was mutated off the Vegan Diner cookbook which my better half found at the library for me - it's got some pretty intriguing recipes - some that really try to be meaty and some that are just loud and proud vegan. I prefer the latter - which don't use faux eggs and meat to try and fit in. Soy isolates can be pretty scary! When I read the recipe, it sounded almost like milopita - a Greek apple cake/pie. Well, my relatives would tell me it's apple pie, but we all know damn well that it ain't - it's more like apple coffee cake. I'm calling this milopita in honor of my Greek Orthodox fasting (vegan diet for nearly 50 days). This cake is seriously delicious - moist, fragrant, and comforting. The base is so spot on that I'm thinking of trying different fruit combos in the future. I know apples aren't in season, but we always have a few to snack on in the house, since let's face NO fruits are in season right now in Pennsylvania. Gotta enjoy the ever-lasting apple! Preheat oven to 350 degrees F. Grease an 8-inch square glass baking dish with pam or some kind of vegan grease. In a small bowl, sift together flours, baking powder, 1 tsp mahleb, and salt. In a large bowl, beat together the oil, brown sugar, and vanilla (almond) extract with an electric mixer. Add the flour mixture a little at a time, alternating with the almond milk, beating until just combined. In a small bowl, combine granulated sugar with cinnamon and 1/4 tsp mahleb. Spread one third of the batter into the prepared dish. Lay half the apple slices on top of the batter, and sprinkle with some of the cinnamon-sugar-mahleb mixture. Spread another third on top and do the same thing with the apples. Spread the rest of the batter over (it may be spotty, but that's okay). Combine the crumb topping ingredients and sprinkle on top of batter. Bake the cake for 50-60 minutes, or until cake is golden brown and a tester inserted into center of cake comes out clean. Remove to a rack and cool before serving. Lenten and delish? I'm all over that, Ban-ANNA! I love apples, apple pies and anything that has apples in it. This milopita with mahlepi spelt looks perfect! Peter - You know it Kalofagas! Katerina - Love them apples!